 An interesting but nonetheless weak follow-up to Arden's (Wisdomkeepers, not reviewed) work on American Indian spirituality and values. 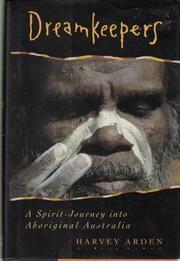 Arden travels to Australia in an attempt to get inside that country's aboriginal culture to produce a volume containing ``Dreamtime'' stories. Dreamtime, or simply the Dreaming, is, for the aborigines, a kind of hybrid: part creation narrative and part physical map. It encompasses the mythic time when the Australian continent was born and its topography turned into a numinous landscape whose every rock and rill has meaning for its indigenous inhabitants. Yet, at the same time, it is contemporary, a place and a state of mind into which believers can enter in the here and now, thus participating in an ongoing creation. From the outset of his trip, the author encounters difficulties. Whereas, he states, his Native American informants were willing, even eager, to talk and share their innermost thoughts, the aborigines with whom he speaks are suspicious and reticent. He is told that the Dreaming is personal and not to be shared with outsiders. Ultimately, he collects very few stories. This volume documents his attempts. Despite this failure, he learns and offers readers a fair amount about people fighting to maintain their traditional culture in the midst of a foreign culture that has overwhelmed them. Though Arden makes a show of doubting the sincerity of his own motives for seeking out the Dreaming (``Get your own Dreamtime,'' one man growls. ``Don't take ours''), he is not so conscience- stricken as to refrain from peddling what he has learned.